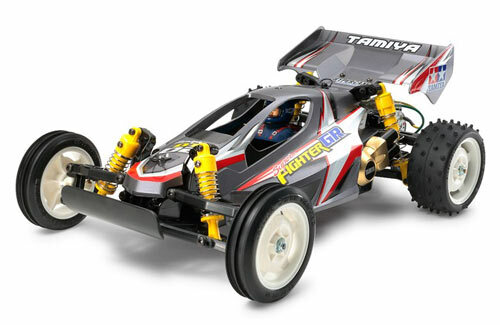 All Products > "58485 Tamiya 1/10 Super Fighter GR"
Super Fighter GR on the entry level DT-02 buggy chassis. The Super Fighter GR features gun metal colored polyethylene body, white wheels, and yellow dampers.Newly designed full-body sticker sheet included. Features ribbed front and spike rear tires. 2WD DT-02 chassis features a longitudinal battery layout for lower center of gravity and optimum weight distribution. 4-wheel double wishbone suspension is equipped with coil spring damped units. Sealed gearbox protects against sand and debris and is equipped with different gears. Driver figure included for heightened realism!